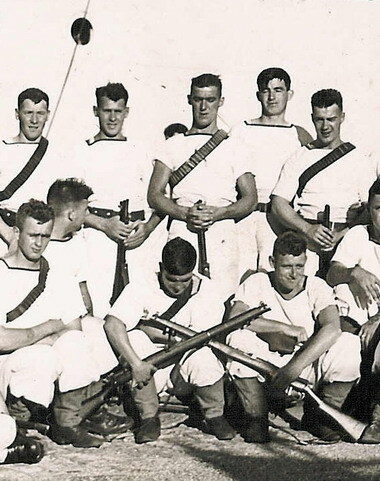 "GILLINGHAM, ALFRED M., LEADING STOKER"
Neptune Field Gun crew. Alfred Gillingham is front row in the centre, dark haired, with his head down - being camera shy - a family trait! GILLINGHAM, Leading Stoker, ALFRED MITCHELL, D/KX 89265. H.M.S. Neptune. Royal Navy. Son of Ellen Gillingham, of Clayton-Ie-Moors, Lancashire. Plymouth Memorial, Panel 52, Column I.